It is the most highly-anticipated non-casino project in the history of the Las Vegas Strip a is almost complete. It is the most highly-anticipated non-casino project in the history of the Las Vegas Strip and the long transition from idle chatter about a world-class arena to architect renderings to a grand opening is just about over. The new golden-color of the arena’s exterior has been developed and has risen like a beacon of light through the south part of the Strip. Now, with construction scheduled to be complete in late first quarter 2016, the arena project is about to enter a phase that is best handled in Las Vegas — a grand opening celebration with equal parts fanfare and pomp and circumstance. 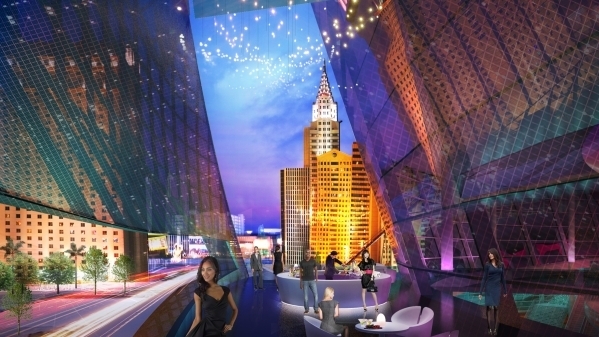 “The grand opening is scheduled for the first week in April, and you can expect both a glamorous ribbon-cutting ceremony and an entertainment-driven event,” says Mark Prows, senior vice president of arenas for MGM Resorts International. Most venues have a grand opening or an opening night. Some have an opening week. Few have an opening month. But in Las Vegas, you have an opening ‘season’. The venue is marketed as an international destination not just because it is in Las Vegas, but also because the sporting events and concert headliners will definitely stretch across U.S. borders to satisfy an international clientele that becomes more valuable with each passing day. The favorable exchange rates, soccer-friendly sportsbooks and an increasing number of direct flights to Las Vegas form the foundation of this latest tourist trend. Prows is also quick to point out that while the management company for the new arena is MGM Resorts International, the company is focused on the strategy of delivering the venue to the Las Vegas market as a ‘neutral’ site. Of course content and brand approvals will be needed to participate in advertising, sponsorships and promotions, but the arena is welcoming all interested parties with open arms. For the arena’s closest stakeholders, the locals, MGM Resorts is planning to host a number of special events which will allow them to understand and exercise the staffing, traffic and parking plans. The Las Vegas arena boasts a spacious and high-tech exterior presence with performance stages, a high-definition media mesh video wall, and outdoor patios on each level. The interior of the arena has both event level suites and lounges, as well as unique tower clubs and lounges for VIP attendees. Sloping event terraces add to the flexibility of the venue. The construction process of the new arena has been a very public experience. Fans can sign up on the Periscope live video program and application to watch monthly broadcasts where MGM Resorts International has teamed up with the potential hockey team’s marketing group to show the arena’s progress on a regular basis. “We feature many of the facility’s special elements while sharing some of the new plans and designs,” says Prows. The big question with the arena is identifying which company will have the naming rights, an announcement that could happen before the end of 2015. MGM Resorts International has already announced the first three founding partners — Schneider Electric, Toshiba and Coca-Cola — and should announce more partners before the end of the year. On the communications forefront, one of the final strategies yet to be determined is identifying if a public relations or marketing firm will assist with the grand opening efforts, or if it will be solely done by MGM Resorts International, or a combination of both.